YJ: What was your childhood in your hometown (where), could you introduce yourself? CW I was born in Hong Kong in a traditional Chinese family, and have spent life in Asia and in the West. I grew up in large cities like Hong Kong, New York and Los Angele, but have also spent a lot of time reveling in the natural beauty of the jungles of Indonesia and mountain ranges across the US. I feel connected to my Asian heritage but have adopted the enthusiasm and spirit of Western inquiry. I followed the traditional path of a good Asian child – did well in school, went to an Ivy League college, had an early career in fashion, became an entrepreneur and then returned to corporate America as a VP in banking with Lockheed Martin and Nestle as my clients. During the stressful and hectic life of a corporate banker, I needed to find respite, and rediscovered the transformative power of Yoga and meditation, so I left my career in pursuit of a happier and healthier lifestyle. YJ: How did you initially discover yoga? YJ : Who were your most influential teachers (or your inspirations)? CW : My parents were brought up as Episcopalians in China, but they never imposed religious views on us as a family. When I was a child, we had a family friend who became a Buddhist nun and as she was discovering the teachings of the Buddha, she told me stories and tales from the teachings. The simple words and thoughts of the Buddha attracted me as a child – Live simply, be kind, help others – these words made sense, and have been my greatest guidance. 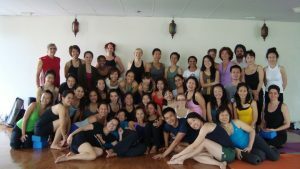 YJ : What is your turning point to be a yoga teacher and how do you teach now? I remember one day practicing with my friend Mariel Hemingway, a beautiful and skilled practitioner, and she turned to me and said “You will be an amazing teacher”. Surprised, I asked why? And she told me that I had spent more time helping her friend find the poses, then on my own practice. It was more important for me to share the practice than to do the practice. YJ : How did your family feel about your becoming a yogi? CW : My family, being traditionally Asian, were initially confused by my desire to leave an “excellent” job – VP at large bank, good salary with benefits and career future, et al. They were worried about how I would make a living, and concerned about earning enough money to live as a single woman in California. My Mother always wished happiness for me, and she taught us to follow our dreams and our hearts, but she was also worried about the “sensible” ways to live in the world. She wanted me to be happy, and for her, happiness included money and security. My Mother had a boundless heart and a rich, full laugh and she knew I wanted to pursue something I loved, but she was very worried about my safety. 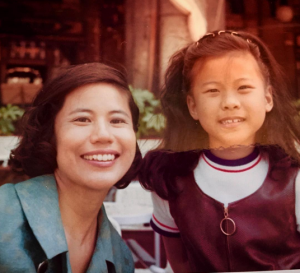 Her own history of fleeing Communist China and making her way in a new country were memories that haunted her, and she wanted me to be able to take advantage of the opportunities of a good, secure income and future in America. She came to a class early on in my career, and she told me after class that she saw and understood then how much I loved my craft.She died as I was transitioning from corporate life to the Yogic life, and I have always felt that she has been an angel on my shoulder cheering me along this path. I wish she could have lived to see me returning to Asia and teaching in Thailand! YJ : What do you definite yourself? CW : I am always a student, and I will always be learning. I can only share what I know, not what I dont know, so I continue to be a Yoga student and I continue to ask questions of my teachers and learn from them, as they learn from their teachers. This lineage is what has created the Yogic tradition and will continue past my lifetime. In Japanese martial arts, one has to wash the dojo floor for many years before ever being able to step onto the mat. I in turn, have been washing the floor for many years, and will continue to pay homage to all those that have learned their craft before me. My asian heritage has taught me to devote much time to learning and studying my lineage, and I remain dedicated to this tradition and heritage of Yoga. My Western mind wants information and sometimes needs “proof” of the teachings, so I see myself as a bilingual, multi culti yogini following paths, crossing paths and making new paths along the way. I need to have laughter and joy in my teaching and I want to give more than I receive from this practice. YJ : What do you wish more students knew? CW : As Yoga has gained popularity in the last 15 years, I see a lot of focus on the physical benefits and a great deal of stress on difficult poses, but I hope there will also be emphasis on the illuminating mental aspects of Yoga. The physical “feel good” happens after most classes, but the deeper effect into life transformation usually happens with a deeper study into philosophy and history. Another wish is from a purely physical side: anatomy and physiology. I see many teachers teaching poses, not the students in front of them. Not every pose is for every body, and no moment is the same. There is a great deal of difference between being flexible and being adaptable. I see many students coming in looking for flexibility, looking for strength, but not looking at their own individual body. As I travel and teach, I see more and more injury. These injuries don’t show up in one day, one week, or even one month, but they do show up over time. Too many chatturangas done without good alignment will do more harm than good, backbends bending into the lower back will harm the spine, and moving without breathing doesn’t stimulate the organs and nervous system. Every day is different, and every body is different. The easiest poses aren’t always the healthiest poses. It is important to build the harmony of strength and flexibility to help Yoga become a practice of transformation and awareness, not a practice of contortion. CW : First and foremost, it feels good, and it feels natural. I spent years doing strict Chan meditation, and I had never been comfortable in the seated lotus position. My knees hurt and my back got sore, so my mind was always chattering away – the monkey swinging from the discomfort of my body to the discomfort of my mind. When I started to do the poses, I became more comfortable in my body which allowed me to sit more mindfully and quietly in meditation. I learned that as the body settles down and becomes more comfortable, the mind actually settles down and becomes more quiet. As I became aware of how my spine felt, what my toes were doing; the sensations of my tongue, eyes, ears and more subtle perceptions helped direct my attention inward. As I began to see and know my body, I began to understand and see myself. As I felt dubtle sensations in my body, my mind began to quiet down – I gave myself the direction to focus and listen inwardly. First it was my body parts, and then it began to influence my sitting practice. The years spent training in traditional Ch’an meditation finally made sense and the addition of a physical yoga practice to seated meditation gave the depth and clarity I had been seeking. I want to share this insight with my students, and give them the encouragement to get connected to their body on the outside, so they can get connected to their mind and body from the inside. If the practice of yoga is becoming too serious, how can we bring more joy into it? Of course, I teach them to be safe and understand their bodies, know what is anatomically healthy and what is not. It is much like playing Jazz music or modern art – one learns to play the scales first, to learn how to draw a face first… then once you have the basic skills, you can explore the edges of the form. Learning basic skills is important in most art: music, painting, dance, photography, and once you have the kowledge of “correct” form, you can play and find your own form. CW : My programme for the 2009 Festival is to introduce the idea of working with energy in Yoga; to look at the lines of energy meridians based on Traditional Chinese Medicine and learn to draw one’s attention inward. As we move past the sensations of large physical movements, and into a deeper awareness of breath and energy, we can find subtle and interesting ways to explore our bodies. This awareness begins in the physical musculo-skeletal – understanding where our bones and muscles are, into deeper sensations of feeling organs like kidneys and lungs, into an even deeper and richer awareness of how the breath moves and how our energy moves with this breath. The language of Chinese energy meridians is similar to the Indian system of nadis and Ayurveda, and TCM is a natural language for me to explain how the microcosm of the body works in the macrocosm of Nature. This focus allows me to teach how to let the poses ebb and flow like a river: the banks of a river contain the water, and the movement of the river creates fluidity and grace. 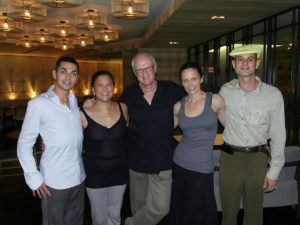 As my teacher Erich Schiffmann taught me many years ago – this awareness becomes a pathway to learn to trust your “inner guidance”.YJ : How about your feeling to join in The 2009 Thailand Yoga Festival?